The U.S. Energy Information Administration has recently released their natural gas monthly statistics for January 2019. In this article, we will briefly review their consumption and exports figures, then look at our estimates for February and March and conclude with our forecast for April, May, and June. 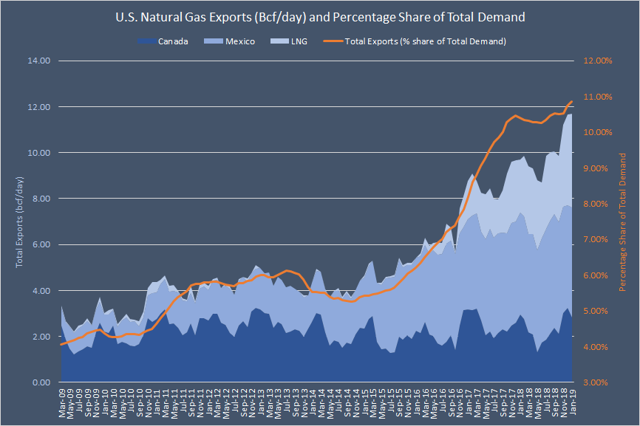 Aggregate demand (national consumption + exports) for American natural gas increased by 3.82% y-o-y in January 2019 to 120.95 bcf/d. Consumption rose by 2.31% y-o-y to 109.25 bcf/d, while exports surged by 20.52% y-o-y to 11.70 bcf/d, setting a new monthly record. Residential deliveries: 946 Bcf, or 30.5 Bcf/d, which was down 3.1% compared with 31.5 Bcf/d in January 2018. Commercial deliveries: 551 Bcf, or 17.8 Bcf/d, which was up 0.5% compared with 17.7 Bcf/d in January 2018. Commercial deliveries were the second highest for the month since EIA began using the current definitions for consuming sectors in 2001. Industrial deliveries: 803 Bcf, or 25.9 Bcf/d, which was up 4.2% compared with 24.9 Bcf/d in January 2018. Industrial deliveries were the highest for any month since EIA began using the current definitions for consuming sectors in 2001. Electric power deliveries: 834 Bcf, or 26.9 Bcf/d, which was up 6.2% compared with 25.3 Bcf/d in January 2018. Electric power deliveries were the highest for the month since EIA began using the current definitions for consuming sectors in 2001. External demand also remained strong, mostly due to higher pipeline exports into Mexico and robust LNG sales, which increased by 8.71% and 75.20% y-o-y, respectively. For the third consecutive month, natural gas exports were the highest for any month since EIA began tracking monthly exports in 1973. In January 2019, the United States exported 4.1 Bcf/d of LNG to 15 countries. LNG exports were the highest for any month since EIA began tracking them in 1997. Strong exports growth and an increase in national consumption ensured that the growth in total demand stayed positive. In fact, on an annualized basis, aggregate demand has not posted a single negative growth figure since January 2010. Total demand continues to grow faster than consumption, a trend which has been in place since May 2015. It points to the rising weight of exports within the overall demand structure. On the chart above, you can clearly see that growth rates in consumption and exports often diverge. 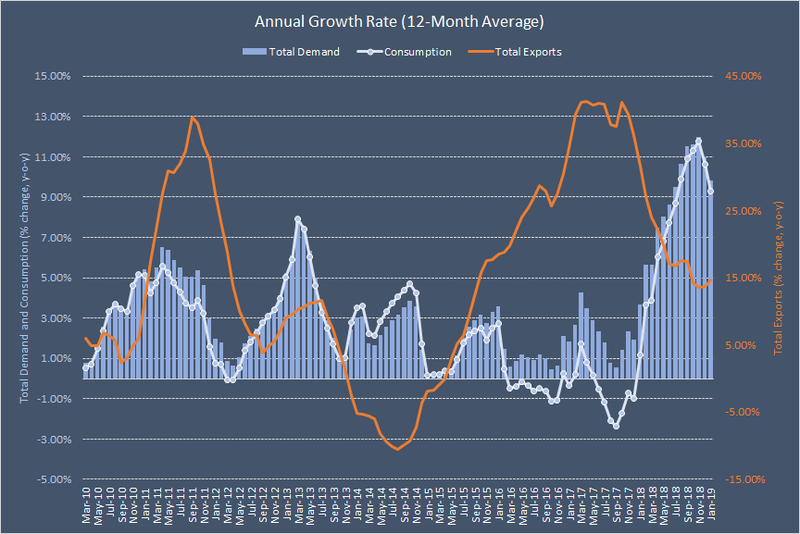 Despite occasionally weak consumption, total demand is still growing in annual terms due to the very strong exports rate. Previously, however, total demand growth was almost entirely driven by national consumption. *Other category includes lease, plant, and vehicle fuels, as well as pipeline and distribution use. 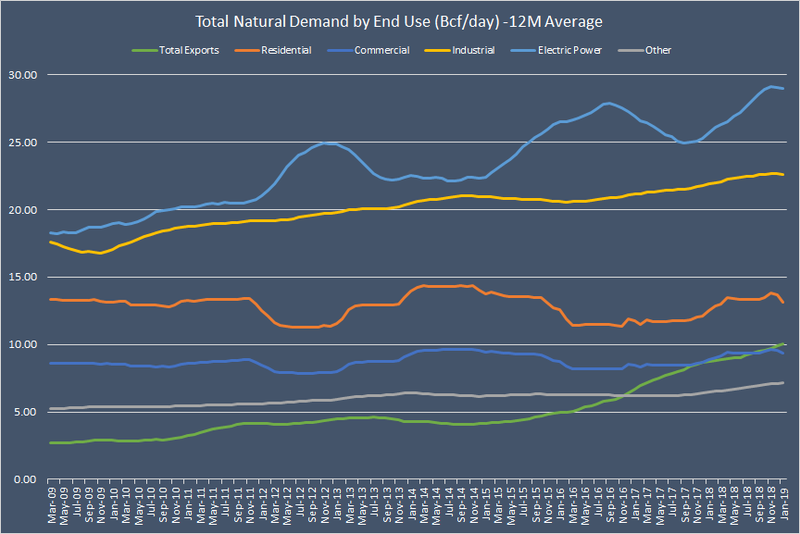 Other fast-growing sources of demand include Electric Power/power burn (+28.7% since January 2014) and industrial consumption (+10.5%). Notice that over the past five years, residential and commercial consumption has remained virtually unchanged. After rising by 2.3% y-o-y in January, we estimate that natural gas consumption then surged by 10.8% y-o-y in February to 106.9 bcf/d thanks to colder weather and a favorable base effect. Weather-induced heating demand also increased in March but less significantly - by around 5.7% y-o-y to 94.6 bcf/d. Currently, we expect natural gas consumption in the U.S. to remain relatively stable, but some minor volatility is possible as a result of frequent changes in the short-range weather models. 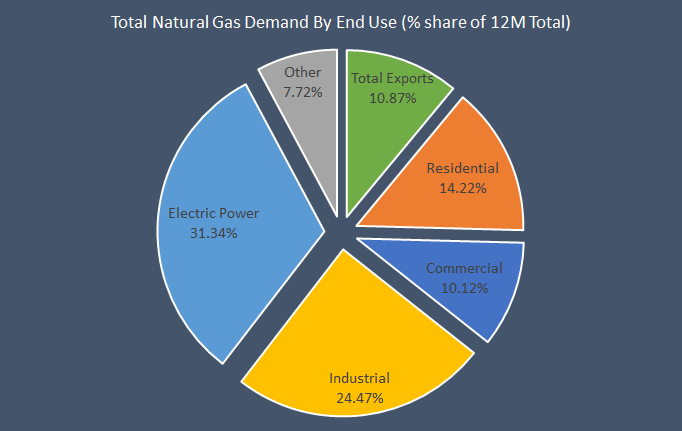 Under the latest weather forecasts, we project that national natural gas consumption will decline in annual terms by around 1.70% (on average) over the next three months (April - June). However, the rate will vary significantly for each month. For example, at this moment in time, we expect consumption to drop by 7.50% y-o-y in April to 72.05 bcf/d (due to below normal total degree-days and very unfavorable base effect from previous year). However, we then expect consumption to rebound slightly and grow by 2.2% y-o-y in May and by 0.3% y-o-y in June. What about supply? After all, it is not the demand which is driving the price, but the interaction between demand and supply. No doubt, dry gas production is strong. The average daily rate of dry natural gas production for January was the second highest for any month since EIA began tracking monthly dry natural gas production in 1973. At this moment in time, we expect dry gas production to average 89.55 bcf/d in April, 90.27 bcf/d in May, and 90.63 bcf/d in June. 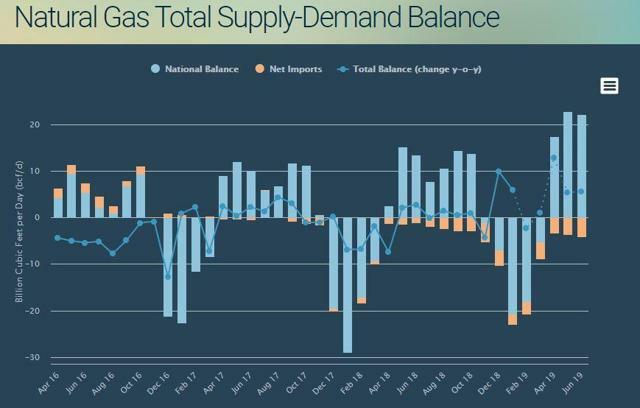 Overall, we believe that over the next three months, total supply will be growing faster (on an annualized basis) than total demand ensuring that total supply-demand balance will be looser relative to 2018. We estimate that annual surplus will amount to +12.83 bcf/d in April, +5.37 bcf/d in May and +5.56 bcf/d in June. As many of you know, we have been bearish on natural gas lately and have been selling the rallies for the past month or so. However, we are not adding to our short exposure anymore and in fact, we have significantly reduced it earlier today. We do not want to get too aggressive on the short side as technically, the market is not overbought and price is near the lower bound of its three-month trading range. Thank you for reading our monthly report. 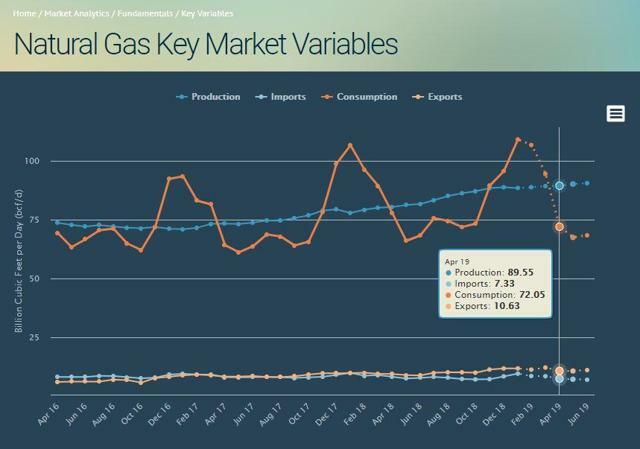 We also write a daily update of our forecast for key natural gas variables: weather, production, consumption, exports, imports, and storage. Interested in getting this daily update? Sign up for Natural Gas Fundamentals, our Marketplace service, to get the most critical natural gas data.